The worst app I’ve ever used, that is supporting a major organization. I’d expect this kind of haphazard design from someone in their garage experimenting with making an app. The entirety of the the design is not only confusing and really not user friendly, but there are repeated links that take you to the same things over and over in a loop of madness. There is nonexistent customer service even though they proudly display a “chat now!” Option. I had that stupid window open for over and hour at one point and was still “waiting for an agent” I’ve also never gotten a response from their email option. But nothing tops paying for a pay per view fight, BUT what you get is literally only the title/main event. You can’t watch ANY prelims or anything else unless you also buy their crap subscription, and even then, your area might be blacked out for some unknown reason that they won’t explain so you can’t even PAY to watch anything else. What a poor excuse for an app. Nothing but greed and laziness went into it. Never ever will I download or use this app again. Who ever is in charge and or created it needs fired. Smh. This app isn’t good. Records are often wrong. I begrudgingly use it for the Fight Library but even that is off, Khabib - Connor is on there but other events from 229 aren’t. Cormier - Stipe isn’t either and that was annoying. 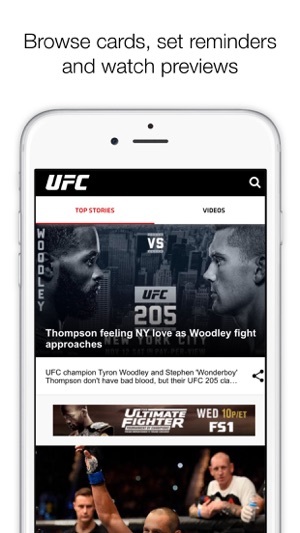 Not sure what their criteria for uploading fights but it definitely isn’t “every fight in UFC History like advertised. Above all, Chromecast support is awful. Once you select a fight, you have to go back a menu to connect Chromecast. Also, there is an option to put a fight in a queue but it doesn’t play after. They also don’t have autoplay. Once you connect it, it’s loud! By far the loudest audio of any app I’ve ever used. Makes it impossible to put it on when trying to fall asleep. Even at my TV’s lowest volume, it’s loud. Then you just gotta hope it doesn’t crash out. 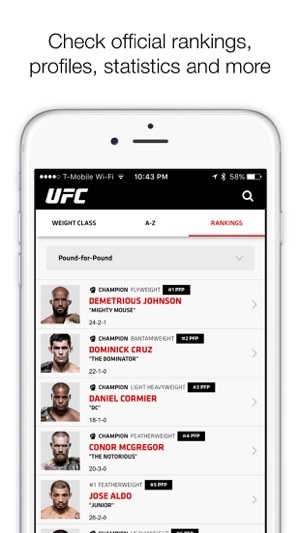 No joke - the app crashes before the fight ends about a third of the time. This could be an awesome asset for the UFC but it’s really awful. 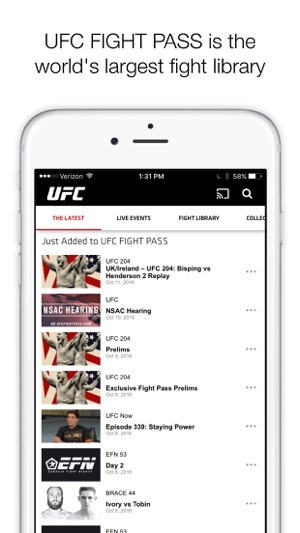 And with the new ESPN deal, no more early prelims on the app. 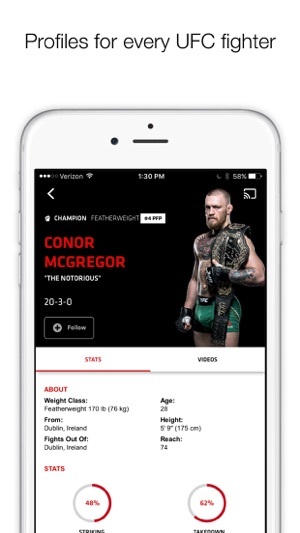 I am a hard-core MMA fan and have had this app over a year. I have a few issues with this app. First off I can’t even see the prelims or main card fighters. This has been going on for at least a month now. Next is certain fights aren’t on all fighters fight list. Example: Cody vs TJ 2. It was on Cody’s fight list and not TJ’s. 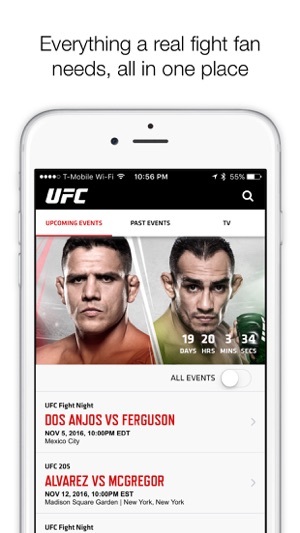 If I pay PPV through this app I should be able to watch it after that night. And I can’t. And lastly why does it take so long for fights from fox or fs1 to get to fight pass. I understand the last two things may not be up to fightpass completely. Also lately if I’m watching a fight card the app keeps backing out and I have to keep going back into the fight and then make the whole card start over. Some other promotions don’t even charge for apps like this. If your going to make us pay can we please get some better product. Y’all are the NFL of fighting, get it together.